What Is DA Form 4651? DA Form 4651, Request for Reserve Component Assignment or Attachment is a form used within the U.S. Military as a transfer request for Army Reservists. 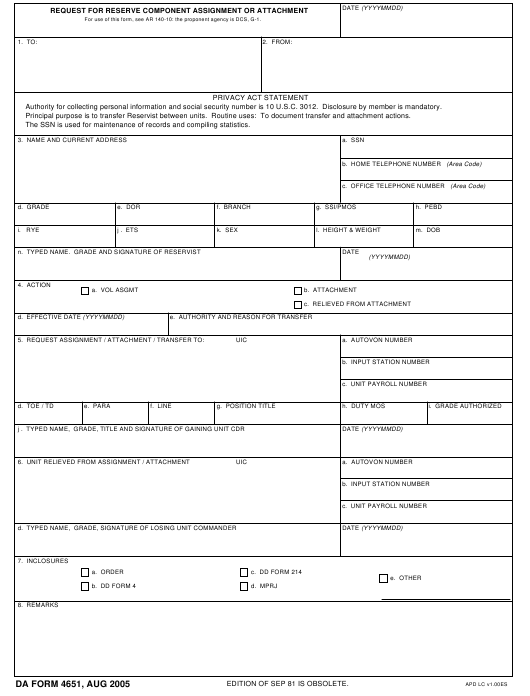 The latest edition of the form was released by the Department of the Army (DA) in August 2005. An up-to-date fillable version of the DA Form 4651 is available for download and electronic filing below or can be obtained from the Army Publishing Directorate website. The DA Form 4651 is to be filled when a soldier who wants to transfer has found another unit. Reassignment between a soldier's current unit and a new unit can only happen with the agreement of both the gaining and losing unit's commanders. All Reserve Duty soldiers wishing to switch between Reserve units need to fill out the DA 4651 and forward it further through the chain of command for the transfer request to be approved. The form needs to be signed by the commanders of both the gaining and losing units to be complete. What Is Rye On Da Form 4651? For use of this form, see AR 140-10: the proponent agency is DCS, G-1. Authority for collecting personal information and social security number is 10 U.S.C. 3012. Disclosure by member is mandatory. Principal purpose is to transfer Reservist between units. Routine uses: To document transfer and attachment actions. The SSN is used for maintenance of records and compiling statistics. EDITION OF SEP 81 IS OBSOLETE. Contact information on the losing and gaining officials is provided in Boxes 1 and 2. The form requires personal information of the requestor, including their name, address, social security number, current branch, height, and weight in Boxes 3a through 3n. The requestor should also state the reasons for transfer. The type of action and reason for transfer is described in Box 4. The form must contain information on the both gaining and losing units in Boxes 5 and 6, together with stated names, grades and appropriate signatures of the unit's commanders. Box 7 lists any additional attachments to the DA 4651. These include orders, a DD Form 4, a DD Form 214, MPRJ or other documentation. Once the request is filled out, it should be provided to the receiving unit and signed there. Before transferring to another unit, the soldier's unit commander and retention non-commissioned officer (NCO) will provide them with reassignment counseling. Afterward, all the documentation will be sent through the chain of command to complete the process of reassigning the soldier to a new unit. If the form is used to request transfers for Reserve Officers' Training Corps (ROTC) scholarship recipients, statutorily or contractually obligated commissioned officers (CO), the form should include a phrase "Scholarship Recipient - recoupment applies". After the completion of the form, it will be forwarded to the proper orders issuing agency. RYE (Box 3i) stands for "Retirement Year Ending" date. The date when a service member enters Active Reserve is called the Retirement Year Beginning (RYB) date. As long as the soldier has no breaks in their service, the RYE will be stated as one year later after the RYB.